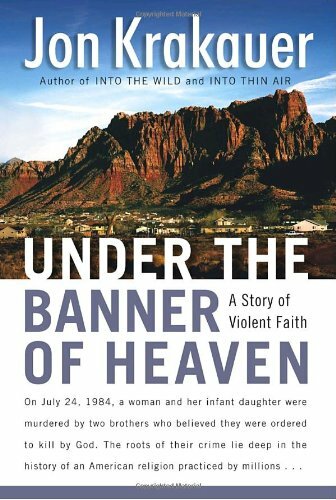 Jon Krakauer’s Under the Banner of Heaven in many ways is unlike his other works. But again he tackles extreme lives, and it is well worth reading. In this book, Krakauer chronicles two brothers who murdered their sister-in-law and her baby. The twist is they claim they were ordered by God to commit these killings, as well as others they were fortunately unable to carry out. The brothers, Dan and Ron Lafferty, are Fundamentalist Mormons, who believe they speak with God, and that polygamy is sacred. Krakauer chronicles the history of the Mormon Church, in all its violence and hatred. Not that that is much different from other religions. However, while the Church of Jesus-Christ of Latter Day Saints became more mainstream in the 1900’s – banning polygamy for example- fundamentalist groups broke off. In places such as Colorado City, AZ, polygamy is still practiced and women are treated as subservient slaves whose only job is to provide children. Often these wives are only children themselves, 14 year-olds married to men 3 or more times older their age. Because they are not legally married according to the laws of the US, they are all single mothers, and the families collect welfare checks from the country they hate. This book is scary. I have many problems with religion, and this only lent more support. I find it very interesting how persuasive these people can be. The polygamists really seem like pedophiles, who use religion as an execuse to practice atrocities against women and children. My only problem with this book is that it was hard for me to follow all the families and names. I mean, when one girl is her own step-mother, family trees get complicated. I also felt the book was a little long, especially when delving into all the history of the Mormon Church. Overall though, this was a fascinating, terrifying, book. This entry was posted in Best Sellers, Book Reviews, Nonfiction and tagged jon krakauer, Under the Banner of Heaven. Bookmark the permalink. Thank you for noting that the polygamist sects are not members of the Church of Jesus Christ of Latter-day Saints. It is certainly confusing when more than one religion is identified as Mormon. Sure thing! I think it’s a very important distinction. Like Fundamentalist Christians, the polygamist sects are very separate from the main religion, and their behavior is not condoned by the church. haha… uhh, that’s great Bertrand, except for the constitution is based on Talmudic law, and our entire moral code is reflected by the Talmud and Christian Bible. Don’t take a cult like LDS and compare it to non-denominational Christianity.